I know I'm a little late. Perhaps you're still nursing a love hangover from last week, but just in case you still feel like spreading a little tenderness and affection throughout the fund management industry, I've created some handy dandy cut out cards to help you express your feelings. Because nothing says "show me the money" like some old school, cut out cards with your name scribbled on the back, right? So share the love y'all! During this holiday week, declare your independence from investment industry stress and worries. Let your cares float away as you enjoy this guided meditation designed for busy investment professionals. Namast-CFA. (C) 2018 MJ Alternative Investment Research. All Rights Reserved. You know what I miss? David Letterman’s old Top Ten Lists. Hands down, those were my favorite part of late night TV. I know that others have stepped in to try to fill the void. Bill Maher has his “New Rules” and Jimmy Kimmel has the often-entertaining “Mean Tweets” but, to me, David Letterman will always be the original king of the recurring hilarious late night bit. 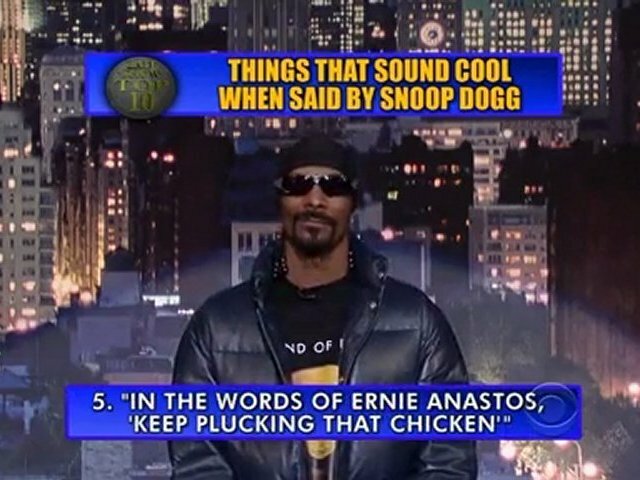 I mean, who can forget the Top Ten Things That Sound Cool When Said By Snoop Dogg? And the Top Ten Reasons Homer Simpson Should Be President. Or my all-time personal fave: Top Ten California Names. 10. Spend the first 35 minutes of a call or meeting talking about your bio. 8. Inability to make polite small talk in lieu of laser-like need to focus on your investment product. 7. Interrupting conversations at conferences and/or staring from two feet away until said investor is so uncomfortable they interrupt their own conversation to acknowledge you. 6. Literally not knowing anything about the investor before you approach them. 5. Two words: Wardrobe malfunction (true stories, but better told over adult beverages than in a blog). 4. Ignoring time zones/weekends/holidays when calling. 3. Mansplaining why an investor’s reasoned conclusion is wrong. 1. Saying “I’m not going to go through each slide.” And then going through each slide. Music is an important part of my daily life. Whether I’m ignoring other passengers on a plane whilst rocking out under my favorite Beats by Dr. Dre headphones, dancing out a bad day in my kitchen, or scaring little kids at the ice skating rink with my early morning musical selections, the music I listen to is a great indicator of my mood and a reasonable barometer for my life at any given time. In fact, many of my regular readers have noted that there is almost always a song lyric hidden somewhere in my blog postings, and I have even occasionally been challenged to work in specific lyrics - a challenge that is almost always accepted, by the way. It’s perhaps no surprise then that as I was winging home from yet another conference on Friday afternoon, I began to think about my various fund manager and investor conversations over the prior two days and decided that maybe what the investment industry really needs is a playlist. That’s right, we all need a break from chasing capital, being chased for capital, due diligence, the low return environment, watch lists and pitch books, so why not get down and get funky? So without further ado, here are reasonably comprehensive musical stylings for nearly every fund manager and investor mood. The song list and use cases are below, and I’ve even created a Spotifly playlist for those of you who want to break out your best Carlton Banks dance moves. “Money” - The Flying Lizards – For both investors and fund managers, because isn’t that what this business is all about? “I Need A Dollar” – Aloe Blacc – For pre-launch fund managers in search of their initial funds. “Uprising” – Muse – Been blocked out of an opportunity by a gatekeeper or a bigger fund? This song will build your motivation to overcome them and succeed. “Price Tag” – Jessie J – Been blocked out of an opportunity by a gatekeeper or a bigger fund? This song may help you keep that loss in perspective and your blood pressure in check. “How Soon Is Now” – The Smiths – …while fund managers who are on their third, fourth or fifth meeting in months hum this under their breath. “What Have You Done For Me Lately” – Sharon Jones & The Dap Kings – Question that should be asked by every investor to their long-time funds. “Shake It Off” – Us The Duo – Get a bad due diligence rating from a consultant? Fix the problems and shake it off. “Every Breath You Take” – The Police – How every investor I know feels at the end of a conference. “Just Got Paid” - *NSYNC – You got an allocation! Woot! “Money For Nothing” – Dire Straights – What anyone outside of the investment industry probably thinks about your job. “Did I Shave My Legs For This” – Deena Carter - For any investor who’s walked out of a meeting with a fund manager that was ridiculously off the mark based on size, performance, fund age, experience, drawdowns, strategy, etc. That was an hour of your life you’ll never get back. 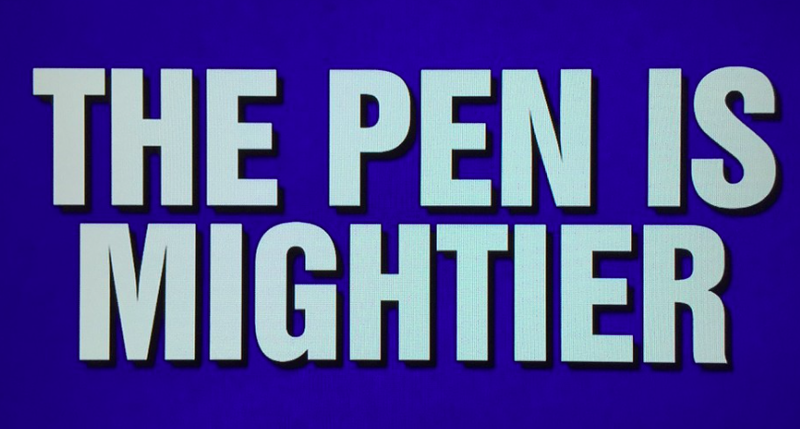 “Fighter” – Christina Aguilera – When an investment you thought was great, isn’t. “I’m Still Standing” – Elton John – When you are coming back from a drawdown. “Everybody Knows” – Concrete Blonde – When you’ve been trying to gather assets for months and keep seeing bigger funds get bigger, even if your performance is better. This one may require a stiff drink. “Somebody’s Watchin’ Me” – Rockwell – Oh the joy of being on an investor’s or consultant’s watch list. 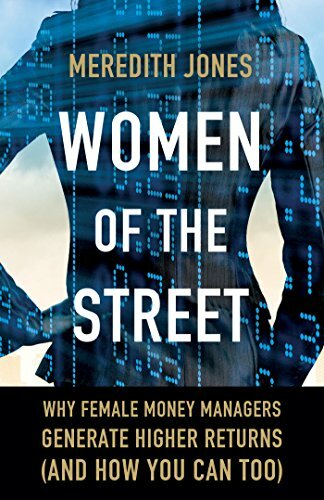 “Extraordinary” – Liz Phair – You know that if investors ever got to know you, they’d want to give you money! “Holding Out For A Hero” – Bonnie Tyler – Investors see hundreds of funds a year – this should be playing as they walk down the hall into yet another meeting. “We Are The Champions” – Queen – When you get your first institutional allocation. “Have You Met Miss Jones” – Tony Bennett – When you read my blog postings. Got suggestions for songs I didn’t include? Sound off in the comments below. And happy listening! As we commence another year of the great capital raising dance, I thought it would be fun to channel all of the back and forth, yes and no, hide and seek frustration into a little game. One that harkens back to a happier and simpler time, and one that anyone who has ever been under 12 or over 60 is familiar with. 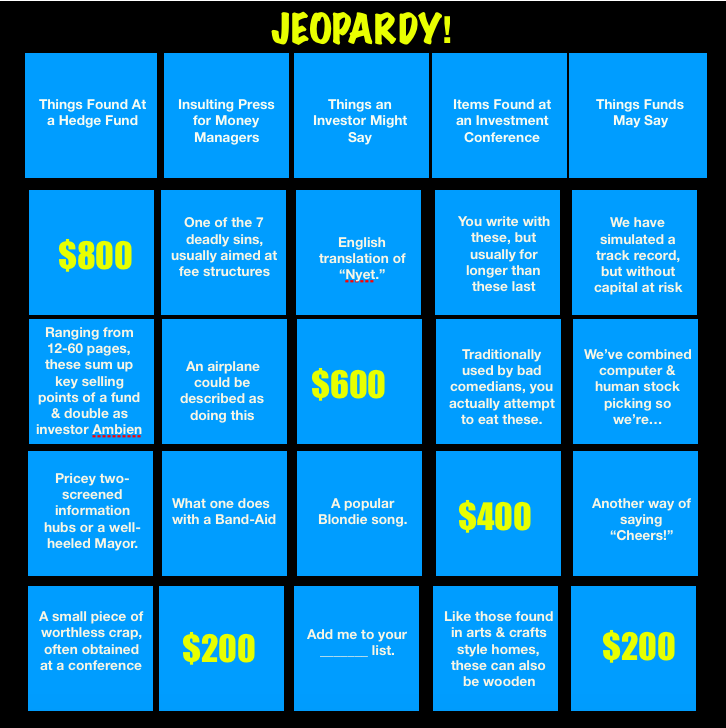 So yes, ladies and gentlemen, this year we're gonna play a little Capital Raising BINGO. Simply print out the appropriate investor or fund manager card below and mark off (and date) each time you get a designated response. The first investor who gets a BINGO can draft me as a single-use meat shield at an event. The first fund manager who gets a BINGO will also get a prize, custom tailored to the fund in question. Happy capital hunting! And may the BINGO odds be ever in your favor! It's often quite amusing to me to chat with friends and associates outside of the investment industry about the investment industry. The vision that many folks have about the typical hedge funders' day-to-day existence is one part conspiracy theory, two parts lies and debauchery and a final part douchebaggery. So, to help clear up some of the most common misconceptions about working in alternative investments (specifically hedge funds), I thought it might be helpful to create a simple visual aid separating hedge fund fact from fiction. 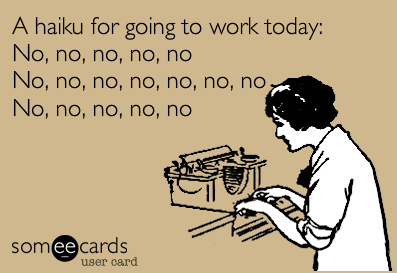 May this give you a giggle as you attempt to re-acclimate to work after the long weekend. Please note: I don't think that the hedge fund industry is in imminent danger of going away, but I do think that, like in Westeros, there will likely be some carnage before we make it through this round of poor average performance and fee, tax and regulatory pressure. Oh, and I don't own any of the images above. And finally, you may have to be 40+ or a bone fide cinematic geek to understand some of the references (Hint: Trading Places, Dr. No, Hitch), but I think you'll get enough of the picture. That is, hedge funds: More PowerPoint than "power suit, power tie, power steering." This week, I decided to spare everyone my usual delivery of salty commentary on the investment arena and instead, use two pictures to say my 1,000 words. Investors can limit themselves by not casting a wide enough net when looking for investments. Oh, and apologies to Raiders of the Lost Ark...although maybe this attempt at spoofing humor will inspire you to watch it again. (c) 2016 MJ Alts. All rights reserved.